As a child questioning the disappearance of his father, he decides to take matters into his own hands and launches a covert investigation with the help of sidekick Ahmed. The quest to track down the truth about how and to where his father vanished propels Omar through the journey of this coming-of-age novel, as much a fictional autobiography as it is a work of historical realism, at times more of a chronicle. Vanished unfolds mainly in Jabalia Refugee Camp in Gaza: Fig trees dot littered, unpaved roads covered with dirty golden sand. Men playing backgammon or smoking shisha and haphazard constructions line the streets. The smells of jasmine and mint wafting out of kitchens, or moss and charcoal after a rainstorm, hang in the air. Regular curfews, funeral marches, helicopter raids by the occupying Israeli military force, and gunfights between Israeli soldiers and the masked men of the Fatah resistance color daily life in Jabalia, the flashpoint of the first Intifada (1987-1991). Like far too many Palestinian refugee camps across the Arab Levant, Jabalia evolved into a ramshackle urban neighborhood, permanent by default, over the decades. The camp was established as a “temporary” solution to house refugees displaced from their villages elsewhere in Palestine during the Nakba, the ethnic cleansing by Zionist forces during the 1948 Palestine War. 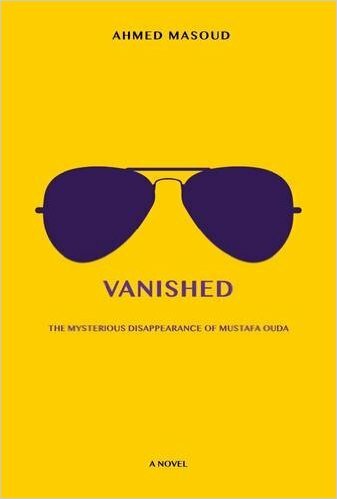 As Vanished recounts, many families were broken by the Nakba; for instance, Omar Ouda’s neighbor Um Marwan, a wise and scraggly old lady who seems to survive on a diet of just olive oil and zaatar, lost her parents and siblings after Israel destroyed their village, Herbia, near Jerusalem. It is from Um Marwan that Omar learns the most about his father; and whenever Mother would see young Omar with Um Marwan, she “would smile without saying hello, the same scary smile she gave me when Father was mentioned.” Um Marwan is a persona non grata, and the strange frigid silence, thick with mystery, between her and Mother – each accusing the other of being “cursed” – exemplifies how decades of conflict, displacement, and occupation have ruptured trust: everyone has secrets, everyone has blood on her hands, no one, young or old, lives without suffering loss. A walk home from the market one day lands the wily and naïve eight-year-old Omar Ouda next to El-Markaz, the Israeli military outpost in occupied Gaza of the first Intifada. He and his sidekick Ahmad had identified the Israeli general Uri Hrabovsky as a top candidate for cross-examination – surely, he must know something about Omar’s father, but of course, the prospect of a child’s coming face-to-face with this terrifying man is all but impossible. But Vanished is chock full of impossible coincidences and terrifying encounters. Omar’s quest takes him into the straits of Scylla and Charybdis, a quagmire of guilt and betrayal. The fundamental premise of the plot is a young boy’s search for his father, but the personal scale of this narrative becomes subsumed by the national battle for Palestinian self-determination. Childish curiosity and the unflinching pursuit of a certain truth cannot, it seems, withstand the all-consuming conflict raging between the Israeli occupiers and the Palestinian resistance movements. In addition to sexual violence, gun battles, and helicopter raids, an intelligence war steadily boils and transforms even the most unsuspecting and innocent characters of all into collaborators. From the tense alleyways and sandy streets of Jabalia, the novel dives underground through the web of tunnels in Gaza and back up again into a secret hideout nestled in an olive grove, where Omar joins the Fatah resistance and trains in secret to become a fighter. He masks his face with a kuffiyeh and rechristens himself Abu Mustafa. With the Oslo I Accord and the withdrawal of the Israeli military from Gaza, the world turns upside down: Omar returns home. He falls for Zoe, a brazen woman from the United Kingdom, and joins the Fatah Society and later the Preventive Security Force to pay for his university studies. A deliberate tone and clinical style characterize the entire novel. At first, the square narration frustrates our desire to engage with the authorial voice of the young Omar growing into adolescence. For instance, how illuminating it could be to probe – from the perspective of a child – those moments of isolation in the hospital room after an Israeli soldier shoots young Omar in the leg or those six months of depression in the wake of a terrible raid that leaves young Omar with blood on his hands. Instead of adopting the narrative voice and perspective of a child coping with trauma as, for instance, Jonathan Safran Foer famously does in his Extremely Loud and Incredibly Close (2005), Masoud takes on the persona and voice of the adult Omar Ouda. It is the adult who recollects, from the vantage point of a 32-year-old husband and father (and British passport holder), the episodes and character portraits of his youth in a memoir-like fashion dedicated to his own toddler son. Crammed into just about two hundred pages, the novel sacrifices depth for an exercise in historical autobiography. Like Extremely Loud, Vanished develops two parallel narrative threads: the young Omar comes of age and the adult Omar strives to return to his homeland during the summer 2014 Gaza Massacre for fear that Israeli bombardments have leveled his family house and killed his relatives therein. Flying from London to Cairo, the adult Omar comes to terms with the fact that, if he is able to enter Gaza, he may not come out alive; and so, as if jinxing the possibility of his own death and of leaving his four-year-old son without a clue about his father’s past, he buys a notebook and a pen and starts his story by looking back on his eight-year-old self in Jabalia. These trajectories reach toward each other, but unlike Safran Foer’s opus, they do not converge, leaving the reader with neither structural nor narrative closure. We could take the decision to leave such prominent threads loose as the author’s attempt to signify the unending nature of Omar’s dilemma. But the novel leaves us less pondering the seemingly endless nature of the narrator’s relationship to an embattled and occupied homeland than uncertain about the various unknowns and perhaps arbitrary gaps between where the young Omar’s story ends and the adult’s begins. The lack of reconciliation between the trajectories of adult Omar and young Omar feels clumsy, especially in a work that bustles with an element of surprise resulting from the resolution of multiple sub-plot threads. The twists and turns of Omar’s journey through the novel leave no stone unturned: he wends his way across two decades to some sense of closure. After a slow start loaded with exposition, the plot and action eventually gain momentum, but Masoud fumbles to sustain the rhythm of his novel, interrupting the quest with lengthy character portraits, the occasional Aesop-like fable from the eighth century Arab literary classic Kalila wa Dimna, and maudlin never-ending monologues by other characters that deflate the moments of dramatic tension. These devices are expedient, and they come at a cost. Certain characters, like the sidekick Ahmed, remain little more than instrumental to the peregrinations of plot. The detours distract us from engaging with the charged, fractal relationships that evolve through nearly two decades in Jabalia. An accomplished writer, director, choreographer, scholar, and playwright, Masoud began to study English, his second language, at university in Gaza about fifteen years ago; and he is a gentle and ambitious storyteller with a knack for action. His clear prose and skillful, engrossing dialogue do not, however, remedy the clunky structure of Vanished, which was perhaps too quickly crafted from the materials of an epic. Still, the dilemma of Masoud’s hero, Omar, and the novel’s illumination of how loyalty to family and nation intersect and clash make Vanished a treatise on the responsibilities we have to confront the legacies of occupation, of lies, and to insist on the disclosure of history’s truths. “All the troubles I had gone through, while they knew everything; all the abuse I received, all the people that had died because of me and all because they had refused to tell me the truth,” says Omar in one of the final scenes of the novel. Are honest storytelling and the divulgence of history the key to reducing conflict and violence? With his debut novel, Masoud seems to propose as much.